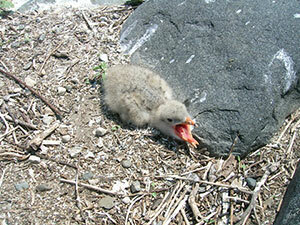 Library image #2519: Caspian Tern chick at Michigan Islands National Wildlife Refuge. The United States Congress designated the Michigan Islands Wilderness (map) in 1970 and it now has a total of 12 acres. All of this wilderness is located in Michigan and is managed by the Fish and Wildlife Service. The Michigan Islands Wilderness consists of Pismire, Scarecrow, and Shoe Islands, three of the eight islands established as the Michigan Islands National Wildlife Refuge on Lakes Huron and Michigan. Scarecrow Island is the largest of the three Wilderness isles, which together form one of the smallest units of the National Wilderness Preservation System. Large submerged limestone shoals located offshore protect a shoreline of rock and cobble. Several colonial bird species - great blue heron, black-crowned night-heron, herring gull, ring-billed gull, great black-backed gull, common tern, Caspian tern, and double-crested cormorant - nest on these islands in substantial numbers. Standing dead green ash trees are the main vegetation, with a lush understory of common elderberry, scattered red-osier dogwood, and an abundance of "weedy" plants. The death of the ash has been blamed on the extensive use by cormorants. In order to protect nesting birds, public visitation is prohibited. Planning to Visit the Michigan Islands Wilderness? In order to minimize disturbance to colonial nesting birds, public visitation is prohibited on all islands within the Michigan Islands National Wildlife Refuge. This includes designated Wilderness on Shoe, Pismire and Scarecrow Islands.